Our friend and fellow activist for peace, Rachel Corrie, was murdered on Sunday March 16, when she was purposely run over by an Israeli-driven, US-made (Caterpillar D9) bulldozer, while trying to prevent a Palestinian civilian home from being demolished by the Israeli military in the Rafah area of the Gaza Strip. Rachel was in Rafah volunteering for the International Solidarity Movement (ISM), a Palestinian-led movement of both Palestinians and internationals working together for an end to the Israeli occupation of Palestinian territory. Rachel and the ISM have chosen nonviolent, direct-action methods and principles to resist the daily brutality of Israel’s 36-year-old military occupation and its ongoing and illegal land confiscation and settlement of the West Bank and Gaza Strip. 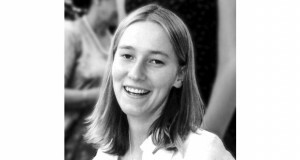 A direct result of the international community’s failure to offer Palestinians an international protection force, Rachel Corrie and other ISM activists have actively confronted Israel’s policy of home demolition and international apathy towards this policy by living with families under threat and by refusing to leave homes or areas threatened with demolition. The ISM believes that its presence slows the process of destruction and hopes that the international community will ultimately act to support the daily nonviolent struggle of normal Palestinian families to exist. Demolishing civilian homes is an atrocious act of violence that violates Articles 12 and 25 of the Universal Declaration of Human Rights and Articles 33, 53, and 54 of the Fourth Geneva Convention. Despite this clear international prohibition, the Israeli military government has carried out thousands of these home demolitions with impunity; resulting in thousands of innocent Palestinian civilians left without basic shelter and experiencing a cataclysmic blow to their lives, some becoming refugees for the second or third time in their lives. Deaths during home demolitions are far too common. On 2 December 2002, 68-year-old Ashur Salem, deaf, was crushed to death when the Israeli army dynamited his home while he was sleeping. On 6 February 2003, 65-year-old Kamla Abu Said, partially deaf, was also crushed to death when the Israeli army razed her home in Gaza. On February 19, brothers Said and Ala Heloo, were crushed to death when the Israeli army blew up a nearby building causing the collapse of their home. And less than two weeks before Rachel’s killing, on 3 March 2003, 33-year-old Nuha Sweidan — 9 months into her pregnancy — was crushed to death when the Israeli military dynamited an adjacent home to her own, causing Nuha’s house to collapse on top of her. This is only a small sample. None of the governments or international bodies that criticize Israel’s destruction of Palestinian homes has taken any concrete actions to stop it, despite universal condemnation by human rights organizations. Words of criticism are empty when they come at the very moment an additional $1 billion in supplemental military aid to Israel and an extra $9 billion in loan guarantees are under consideration by the US Congress. Rachel’s death should at least give them pause. Instead, news of her death was juxtaposed in one newspaper with two articles detailing wide bipartisan support for further aid to Israel. On Sunday 16 March 2003, Rachel and her fellow ISM volunteers were confronting the drivers of two bulldozers who were in the process of razing Palestinian civilian land and homes. For two hours, Rachel and other ISM activists followed the bulldozers, trying to block their passage and hamper their efforts at destruction. Rachel was clearly identifiable in a bright fluorescent orange jacket and was speaking through a bullhorn when she was brutally run over. In its attempts to sweep responsibility for the incident under the carpet, the Israeli government has undertaken efforts to discredit Rachel, and to blame her and her colleagues for her death. Reports from the other seven ISM volunteers who witnessed the event and what is plainly obvious from photographs taken at the scene — before and after — make it incredible to assert that Rachel’s death was an “accident”. 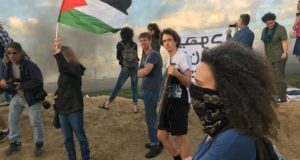 Following her crushing by the bulldozer, an Israeli tank came near the fallen activist and her friends, and then backed off. At no point did the Israeli forces offer any assistance. The Israeli government typically blames its victims for their fate. In the pages of the international media Palestinians whose homes are destroyed or who die trying to protect them are reflexively called “terrorists” or “terrorist supporters”. Rachel was not Palestinian and therefore was hard to label a “terrorist”, but nevertheless, Rachel was blamed for her own death. In addition, Rachel was accused of “protecting terrorists”, even though the home she died protecting was that of a Palestinian medical doctor. – When she was killed, Rachel was engaging in what is typically a relatively low-risk action, serving as an international monitor to an ongoing, blatant abuse of international human rights law and confronting a soldier in the process of committing an act of violence against an unarmed, nonviolent Palestinian family. – Rachel was clearly identifiable and non-threatening in both her nature and approach. Rather, Rachel did put her life on the line to stand up against a policy that is inhumane. Thousands of people do this every single day around the globe, in an effort to stop violence and atrocities against land, people, animals and crops. In this case, the bulldozer driver decided not to stop when Rachel nonviolently confronted him, instead choosing to run her over with a 9-ton bulldozer. Rachel is guilty only of assuming that another human being into whose eyes she was looking would not take her life. – Eyewitness testimony to Rachel’s killing is clear and consistent. However, some journalists chose to selectively quote Rachel’s colleagues, leading to different reports of the events that led to Rachel’s death. For example, some media outlets reported that Rachel “slipped and fell”, leaving out the additional detail her colleagues reported — that she fell under the weight of the dirt and rubble that was heaped on top of her. – Some journalists reported that Rachel sat, crouched, and/or lay in front of the bulldozer, implying she could not be seen. Witnesses report that first she sat down in front of the bulldozer when it was still at least 10 meters away and she was in plain sight. Then as the bulldozer kept advancing, she got up, climbed up on a mound of dirt and rubble, in order to look the bulldozer driver in the eye. It is not credible to assert that the bulldozer driver could have missed her. – The photographs taken on the day of the incident and at the scene show various angles of Rachel engaging the bulldozer drivers and show two different bulldozers. Again, reading the eyewitness testimonies will clarify that Rachel and the other ISM volunteers were in the area engaging two bulldozer drivers for approximately two hours before Rachel was crushed. The photos are 100% consistent with the eyewitness accounts and offer clear evidence that the bulldozer drivers were aware of the presence of the ISM volunteers and their efforts. – The Israeli Embassy in Washington DC has been using quotes by Thom Saffold in the Washington Post (Monday March 17, 2003), to try to advance their claim that Rachel bears sole responsibility for her death. 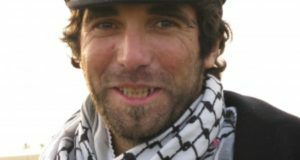 Thom Saffold, while a previous volunteer with the ISM, is not a spokesperson for the ISM, he was not present at the incident, nor is he currently in Palestine with the ISM. Washington Post correspondent Molly Moore distorted the plain meaning of Saffold’s words when she irresponsibly composited three separate and unrelated statements into a single quote that does not reflect the philosophy of ISM or Saffold’s original meaning. Rachel Corrie was acting in the tradition of Mahatma Gandhi and Martin Luther King when her life was deliberately snuffed out. Many justice and human rights defenders before Rachel have lost their lives in their struggle for righteousness and in their attempts to make this world a better place and, sadly, others will follow after her. Rachel was a mature, conscientious human being who worked to bring people together and did wonders as an ambassador of the true face of the American people in a different part of the world — an American people that does not turn up outside Palestinian homes and give their occupants 5 minutes to gather what possessions they can, before bulldozing into dust the fruits of a life spent working to provide for a family. In a very direct way, Rachel stood up for family values and for those who were too poor and powerless to be able to protect themselves. She was a true American hero. The United States government has a particular responsibility to investigate Rachel’s death, not only because she was a US citizen killed by a foreign government, but also because the US government actively supplies Israel with the military hardware and funds that enabled and continue to enable Israel to carry out these illegal and immoral acts. The world cannot go on ignoring the violence that continues daily to claim the lives and livelihoods of many other unarmed, nonviolent Palestinian civilians. Rachel Corrie offers us an opportunity to look through a window into the Israeli-Palestinian conflict and see things as they are. Let us not close the curtains and go about our business. She and the people of both Palestine and Israel deserve better.